Preheat oven to 350°F. Lightly grease an 8x8 or 9x9 pan or line with parchment paper. In a large bowl, mix together oats, flour, baking soda and salt. In another large bowl, cream butter and brown sugar until light and fluffy, about 3 minutes. Beat in egg and vanilla. Add red food dye until mixture is a vibrant dark red color. Amount varies on the strength of your dye. Approximately half a bottle of liquid dye. Slowly mix in dry ingredients. Add additional dye if needed. Press 2/3 of the dough into the bottom of the prepared pan; set aside. In a small saucepan over medium heat, melt the chocolate, sweetened condensed milk and butter, stirring frequently until smooth. Pour the fudge over the layer of cookie dough and spread in an even layer. Dot top of fudge with spoonfuls of remaining cookie dough. Bake for about 20 minutes, or until cookie dough is almost but not quite set. Let cool on a wire rack before cutting into bars. 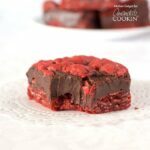 This recipe for Red Velvet Oatmeal Fudge Bars was printed from AmandasCookin.com - https://amandascookin.com/red-velvet-oatmeal-fudge-bars/ and can only be printed for education or personal use.